Home / maxbpo / How to Improve Data Entry Accuracy? Whether large and small, businesses today live off the data in hand. The amount of usable data and its accuracy often define the success of many aspects of a business, especially when it comes to filing, analysis or revenue generation processes including sales. It is important to have Data Entry Accuracy to achieve desired results that ensure you optimise your time, resources and the opportunities at hand. Having faulty data can also be frustrating for your team members affecting their morale and of course, hitting your revenues and reporting structures. It is vital to get the data right and then work on the same. Data Entry Services hold great value for a business. Outsourcing this non-core activity to a reputed and experienced Data Entry Company would add immense value to your validity and accuracy of data and its usability. With the advent of globalisation and technology, Data Entry Outsourcing is popular and in fact the need of the hour. The BPO would help you in your data entry services with multiple checks in place for accuracy and compatibility alongside your systems. The aim is to get your data as accurate as possible. Let us look at some ways and steps you should incorporate to achieve the relevant accuracy of data. The top 9 best practises to achieve accuracy in data services are listed here. The right software matters to the overall accuracy of data e.g. Optical Character Recognition (OCR) software can help in automatically converting the image-based text into an editable text. Using the right tools is your first step to achieving success. If the investment in technology seems higher vis-à-vis the scope of work, then consider outsourced service providers who can offer value using the latest technology. Touch screens could be an innovative way to enter data, often now used by the bigger firms as its standing desk option tool. You need to understand the scope of work and the strength of the team. Set goals which are achievable by your team and then set out to work towards them. The team should not be rushed and pushed into the process. This way the data entry is more relevant. Whether the data inaccuracy happens when being entered or does it happen when it is being moved to storage. Once you identify what is the area where you are facing the issues, then it is one step closer to achieving data accuracy. It is imperative that there be double checks on data and random audits to ensure the processes are being followed. Leaks in processes can lead to data errors regularly. It is best to place the procedures and ensure they are complied with. 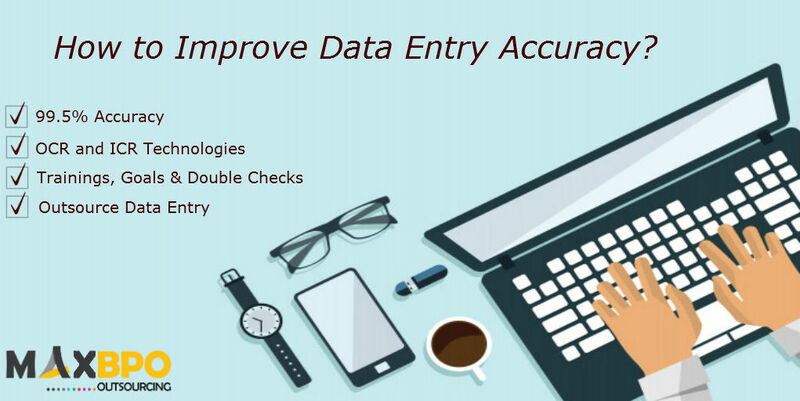 Handling inaccurate data and being identifies either manually or via automation is important to the success of data entry solutions. So, if the data was supposed to 9 characters and the system identified an error entry with 11 characters, it is worth its weight. Regular training is the need of the hour. The employees need to understand and be reminded time and again of the importance of their work and the impact it creates on the overall process. Keep the team motivated throughout by rewarding them for short stints of good work. This improves efficiency and minimises errors. Incorporating higher standards of data entry process that may include but are not limited to Geo-coding, data profiling and monitoring, etc. will only reap great rewards for the longer term enabling higher standards of accuracy of data entry. Leave the work to its experts. While you are good in your core business, leave your non-core activity of data entry to its set of experts. This way you save time and money and use experienced personnel for the data entry tasks. Many big and small firms are now outsourcing data entry services to specialised outsourced units (Data Entry Companies). Doing thisnot only relieves you of the painstaking stress and implementation of the processes beyond investments in technology it also allows you to spend your time on your core business tasks, which allows you the freedom to grow as planned and look at the larger vision rather than working within the non-core activities like data entry. The data entry company employs experienced manpower resources to complete the tasks of data entry in a specialised manner, and are able to provide quality data entry services to organisations globally. The investments in technology made by the service provider help relieves you of that investment too while still being able to reap the benefits of the same. Over a period of time, this result in multiple gains for the outsourcing firm and helps you focus on the larger business.